The initial words and name of a portion of the liturgy recited with special solemnity on the Penitential Days from New Year to the Day of Atonement inclusive. In the ancient liturgy the two invocations, "Our Father" and "Our King," found separately in the Bible (Isa. lxiii. 16, lxiv. 8: "Our Father!" also in the Itala version of Tobit, xiii. 4, and Isa. xxxiii. 22: "Our King"), are either placed together in corresponding sentences, as in the Eighteen Benedictions, the fifth and the ninth, "Forgive us, Our Father, for we have sinned! Pardon us, Our King, for we have transgressed!" or simply combined as in the prayer known as "Ahabah Rabbah" and in the Musaf of the Festivals: "Our Father! Our King! Reveal the glory of Thy kingdom to us speedily!" This combination became a standing formula, like "Our Father in Heaven!" or "Our God in Heaven!" particularly in penitential prayers. During a great drought the usual fast-day was held, and the Twenty-four Benedictions prescribed for such occasions were recited by Ëliezer ben Hyrcanus, yet without avail; but no sooner did Akiba step forth and recite the prayer, "Our Father! Our King! Thou art our Father! Our Father! Our King! We have no King besides Thee! Our Father! Our King! We have sinned before Thee! Our Father! Our King! Have mercy upon us! Our Father! Our King! Act unto us for Thy name's sake!" than rain came (Ta'anit, 25b, according to the better version in Jacob ibn Ḥabib's "'En Ya'aḳob"). This story by no means implies, as has been assumed by many writers, that Akiba was the first to recite the "Abinu Malkenu," as quite the contrary is the case. That word of defiance to the worldly rulers, "We have no King but Thee!" originated in circles of which Akiba was only a late though a faithful follower. Of how many verses the original "Abinu Malkenu" prayer consisted it is difficult to tell. In our printed Talmud two verses only are mentioned in the story of Akiba: Alfasi has three. In all probability there was at first no fixed number or order, the arrangement being left entirely to the one who offered the prayer on the occasion. The introduction of the "Abinu Malkenu" in the liturgy of the Penitential Days naturally led to certain changes and to a more or less fixed system. The confession of sin received the first place, and prayers for the New Year, for an inscription in the Book of Life, and (with a view to the Day of Atonement) for an inscription in the Book of Pardon and Forgiveness suggested themselves. Still, there remained a wide divergence in the various liturgies. According to one tradition ("Tanya," p. 74) the "Abinu Malkenu" consisted originally of nineteen verses, corresponding with the Nineteen Benedictions of the augmented "Shemoneh 'Esreh." There is, indeed, a relation between some of the verses of the "Abinu" and some of the Benedictions. "Our Father! Our King! bring us back to Thee in repentance!" corresponds with the fifth section of the "Shemoneh 'Esreh"; "Pardon our sins!" "Forgive our Transgressions!" with the sixth; "Send Healing!" with the eighth; "Inscribe us in the Book of Sustenance!" with the ninth; "Destroy the devices of our enemies!" "Let salvation sprout forth!" "Lift the horn of Israel!" and "Lift the horn of Thine anointed!" correspond with the tenth, twelfth, fourteenth, and fifteenth Benedictions respectively; "Hear our voice!" "Receive our prayer!" with the sixteenth; but the rest show no connection with the other ten Benedictions. Nor, in fact, are the nineteen verses singled out in "Tanya" found in Amram Gaon's text of the "Abinu Malkenu." From Amram Gaon we learn that the "Abinu Malkenu," in the time of the Geonim, was regarded as an institution of the ancients, to be recited on the Ten Penitential Days. Jacob Asheri ("Ṭur," i. 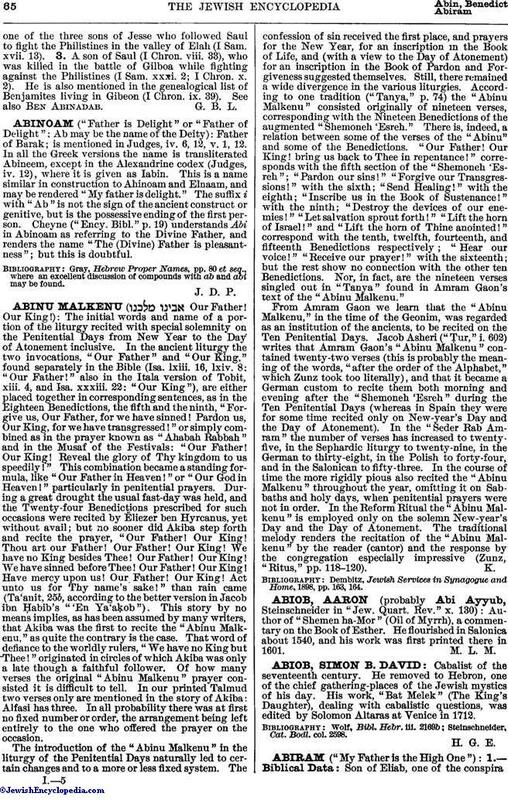 602) writes that Amram Gaon's "Abinu Malkenu" contained twenty-two verses (this is probably the meaning of the words, "after the order of the Alphabet," which Zunz took too literally), and that it became a German custom to recite them both morning and evening after the "Shemoneh 'Esreh" during the Ten Penitential Days (whereas in Spain they were for some time recited only on New-year's Day and the Day of Atonement). In the "Seder Rab Amram" the number of verses has increased to twenty-five, in the Sephardic liturgy to twenty-nine, in the German to thirty-eight, in the Polish to forty-four, and in the Salonican to fifty-three. In the course of time the more rigidly pious also recited the "Abinu Malkenu" throughout the year, omitting it on Sabbaths and holy days, when penitential prayers were not in order. In the Reform Ritual the "Abinu Malkenu" is employed only on the solemn New-year's Day and the Day of Atonement. The traditional melody renders the recitation of the "Abinu Malkenu" by the reader (cantor) and the response by the congregation especially impressive (Zunz, "Ritus," pp. 118-120). Dembitz, Jewish Services in Synagogue and Home, 1898, pp. 163, 164.